Short and sweet tonight because someone (aheeeem) already forgot that she had something she was supposed to be doing every day in November! I hope you don’t only allow yourself to eat stuffing on Thanksgiving. I mean, why is it that something so delicious, so universally adored (as least in our families) is limited to just one day a year? We don’t only eat apple pie once a year, perishthethought. Nonetheless, I have decided to single-handedly spearhead the effort to bring stuffing into the everyday repertoire, and this, this a marvelous place to start. Bacon, cashews, sourdough cubes, spinach, onion and garlic are baked inside hollowed-out onion shells, allowing not just a pretty wow-factor but a neat and effective stuffing-delivery vehicle for those of you not actually stuffing a bird. But this stuffing would be phenomenal anyway you baked it, up a bird’s bum or even in a baking dish, and I do hope you bookmark it for when you’re seeking out a recipe in a few weeks. Or tomorrow night. Because if you knew how good it tasted, you wouldn’t even wait that long. A whole bunch of notes: If you only want to make the quantity for stuffed onions, even half of this is slightly more than enough, leaving you with the option of using an extra onion or two, or just baking it in a pan. If you wish to make this vegetarian, simply omit the bacon, and cook the filling in olive oil instead. Vegetable stock can be swapped for turkey. If you’re freaked out about hollowing out an onion, believe me, I was too. I dreaded and dreaded it, and then–voila! I used a melon baller. Working carefully, you’ll be surprised how easily it works. If you’re stressing because you have a lot of guests coming over, you can definitely do the onion-hollowing step a day or two in advance. The stuffing can be made in advanced as well, then brought to room temperature before filling and baking. Make onion shells: Cut a 1/2-inch-thick slice from tops of onions, discarding tops, and trim just enough from bottoms for onions to stand upright. Scoop out all but outer 2 or 3 layers from each using a small ice cream scoop or spoon (don’t worry if you make a hole in the bottom), reserving scooped-out onion and onion shells separately. Make stuffing: Coarsely chop enough scooped-out onion to measure 3 cups. 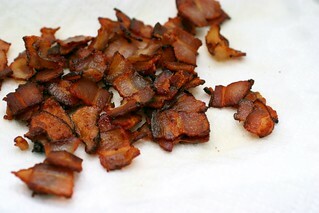 Cook bacon in 2 batches in a 12-inch heavy skillet over moderate heat, stirring, until crisp, about 10 minutes, then transfer with a slotted spoon to paper towels to drain, reserving about 1/3 cup fat in skillet. 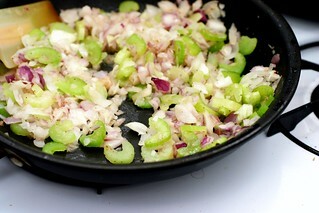 Add chopped onion, celery, salt, and pepper to skillet and sautÃƒÂ© over moderately high heat, stirring, until vegetables are softened, about 5 minutes. Add garlic and sautÃƒÂ©, stirring, 1 minute. Transfer mixture to a large bowl and stir in spinach, bread, cashews, butter, 1 cup stock, and bacon, then cool completely. Roast onions: Preheat oven to 425Â°F. Arrange onion shells, open sides up, in a 13- by 9- by 2-inch baking pan, then add 1/2cup water and cover pan tightly with foil. Roast onions in middle of oven until tender but not falling apart, 25 to 30 minutes. Stuff and bake onions: Reduce oven temperature to 350Â°F. Transfer shells to a work surface and pour off water in pan. Fill shells with stuffing, mounding it, and return to pan. Reserve 5 to 7 cups stuffing for turkey cavity, then put remaining stuffing in a buttered shallow 3 1/2-quart baking dish and drizzle with remaining 1/4 cup stock. Bake stuffed onions and stuffing in dish in middle of oven, uncovered, until heated through, about 25 minutes. Those look heavenly! I love how the red and white onions look next to each other. This looks really good. My husband isn’t a fan of onions so I wonder how the stuffing would go with bell peppers or acorn squash. I’d do onions for me. I love them. I made stuffed red onions with feta a while ago, and really liked them – quite a showpiece! Your versions sounds just as excellent – thanks for inspiring me to make these again soon! I have stuffing all the time. It’s one of my favorite foods, and so easy and cheap, too! 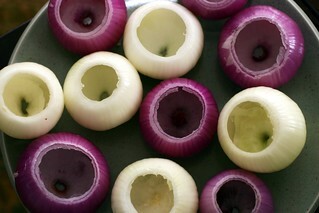 I love the onions, especially the purple ones. They’re beautiful! This is awesome!! I love the idea behind it and the vegetarian option! I like onion anything, so this looks like a great thing to try! Wow, those are seriously impressive. I love how the onions become all translucent and you can see the stuff, just barely, through them. Neato keen! Yum… I used to stuff onions quite a bit some years ago. Try par-boiling those onion shells in a little water with a couple of cloves in it. I promise you won’t regret it! I make a slightly different version stuffed with sausage, wild rice, and the chopped onion, but this looks like a great idea! You’ve really outdone yourself with this one… absolutely stunning! Oh, my… these are gorgeous. I’m a little scared about the onion-scooping bit, though. I’m having visions of floods of tears. Still, I think I’ll have to try this for turkey day. Wow. I am dying to make these. Why, oh why does my family hate onions? These would be so delightful for Thanksgiving! I love how elegant this looks. Definitely will try it one of these nights before serving them on Thanksgiving. THanks for the recipe, Deb. Wow, these onions are beautiful enough to make me cry. Those. Look. Brilliant! And nope… I do not limit stuffing to Thanksgiving. 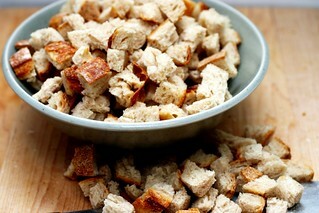 Living in San Francisco I’m privy to fresh sourdough… which makes amazing stuffing/panzanella! I don’t get it. What are you doing every night in November? These look divine! I’m seriously considering this for my small Thanksgiving-for-the-in-laws this year (although I’ll be caned if there aren’t any leftovers…). Any conceivable way to prep these in advance (1-2 days), then just pop in the oven on the day of?? OY… Just re-read this and the answer is right in front of my face! I guess I was bowled over by the amazingness of the idea! Straight from the horse’s mouth: These were DELICIOUS, and the minimal bread cubes didn’t even cause Dr. Atkins to roll over in his grave. I must say that the 5 glasses of McCallans may have affected my taste, but it was good! Thanks. We’re coming back and will even climb those damn stairs for food this good. Huh. A melon baller to hollow out the onion. What a great idea! Excellent. I am Officially In Charge Of Stuffing every year in our house at Christmas. I think I’ll try this recipe this year — which should give me, ooh, about 56 days to practice. Stuffing every day for the next 56 days! What is this, heaven? I agree – stuffing should NOT be reserved for/eaten on Thanksgiving. 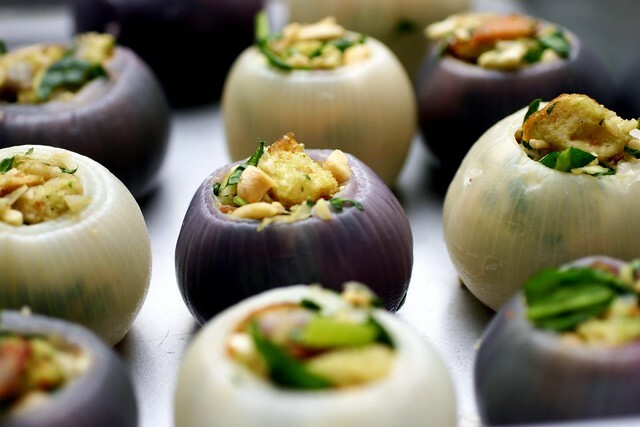 Wow, these roasted stuffed onions have such an elegant presentation, and look positively delicious! I think this is a beautiful recipe – what a wonderful presentation! Can someone describe to me what the onions taste like in this dish? I love cooking with onions, but I’ve never thought to eat them stuffed like this. It almost makes me think there would be too much onion taste, but I have a feeling it’s quite mild. Someone describe please! :-) And I agree with laura k, I think the coolest part about the pictures of the finished product is the fact that you can kind of see through the onions. They’re really pretty to look at. Oh and honsetly, I don’t think you SHOULD only eat stuffing at Thanksgiving, but I find that I forget about it until Thanksgiving, therefore I don’t eat it until then. I’m going to have to put a stop to that! I adore stuffing! It should be eaten at least once a week! It’s fall and Thanksgiving is almost upon us. I went to 3 different grocery stores and everyone was out of turkey necks! I was imagining the house smelling like turkey, making mashed potatoes to go with that yummy turkey gravy. No luck. I guess everyone else had the same thought. My son was so disappointed when I told him the town was out of turkey necks, no gravy for him. If given a choice he could live on mashed potatoes and turkey gravy. Oh the recipe I use is the Sunset Magazine -Classic turkey gravy. Wow! I love the idea of roasted and stuffed onions! Thank you, I am going to try making these for my dinner guests tomorrow night. the lighting is soo beautiful. great shots deb! Looks great! I’m totally using this recipe for Thanksgiving!! Make this last night. O my God, this is sooooo good, the whole family loved it. Used stock instead of water in pan. Wow the onion’s see-throughed color is amazing! I hosted an Iron Chef Potluck dinner where onions were the “theme ingredient” and my boyfriend and I made this recipe. It was a huge success! We made “dirty” roasted garlic mashed potatoes and put them on the plate first, then had sauteed spinach on top of that, then plopped the stuffed onions on top of it all. The presentation was quite impressive and the guests loved all the flavors and textures. It did take a lot of prep to make these, but with two people it was manageable. cool! I am making this for T-day because they are just cool looking. I love the fact that there are spinach in there too. I am always looking for ways to sneak in as much veggies as possible =) portion control people! i made desserts! I might replace the cashews with some chestnuts and hit the stuffing siwth some cream? I am pretty concerned with hollowing out all those onions though (we have 15 peeps coming and so i figure i need to make at least 25-30 for leftovers) geez… should i par boil them so i don’t have to deal with tears? or do you guys hollow under water in the kitchen sink? I love this recipe; make it all the time. I recently tried to adapt it for some turnips I had with less than stellar results (http://www.dinnercakes.com/2008/11/more-cabbage-roasted-stuffed-turnips.html). The bitter of the turnip was just too dominant. I was wondering if you had any recommendations on what I could do differently? Even the sight of this dish makes my mouth water! Just wanted to share that I made this beautiful onions last Thanksgiving. They are know securely part of my “signature” dishes. Thanks SK! Is it wrong that I’m looking at Thanksgiving recipes in June? No? Okay, good. This looks so yummy! I can hardly wait to serve it next October. Oh my — I wondered last week why I was buying a bag of red onions when #1 it’s just two people I am cooking for, and #2 I always buy sweet onions. Still — they were just so pretty and I always get seduced by pretty at the market. Now I know what to do with at least some of them. Hey, I’ve decided to make this for thanksgiving this year. I’m making a whole lot of things a few days before. How long do you think this last in the refrigerator before I have to serve it? there are only 2 of us so im cutting this in 1/4ths…. litttle nervous about getting the amounts right but it looks so delicious i cant resist!!! I have tried removal of the inside of the onion prior to par boiling , after par boiling all with success; however, placing the onions with just a very small amount of stock in the bottom of the dish and salting and lightly peppering, a few minutes in the microwave makes the job really fast and simple! I use a steak knife to gently cut around all but last two layers and a small fork to remove center. Be sure to pour off any liquid and not let the shells soak. So I’ve been saying for a whole week how I was going to make this and then when it came time to it, I just didn’t have time to do the whole onion cup part. HOWEVER, I did make the inside and it was fantastic. I just cooked the stuffing in a 9×13 glass baking dish (I halfed the recipe, btw) at 350 F for 20 min uncovered. I did pour almost the whole amount of stock over the bread crumbs though because I figured since it wasn’t going to be in its onion shell then it might dry out. We were only cooking turkey legs so I didn’t have a whole bird to stuff. I just wanted to pass this along for anyone else that doesn’t have time for the onion cup portion, but still wants fabulous stuffing. I just made this for the first time yesterday and it was FANTASTIC!! I made a vegetarian version, so no bacon and veggie stock instead. My husband and our friends said it was the best stuffing I have made. Everyone loved it. I just recently was introduced to your site and I made three other items from it for our Thanksgiving dinner. I will be coming back a lot! Thanks! This sounds like a delicious recipe, promising for the vegetarian (host or guest) who wants the stuffing, but not when it is inside of a turkey. Might try it sometime. Thanks for sharing. Less, the bacon part, of course! I wished that I can use each core of the onion for different sizes without breaking them. TOO bad there is no edible glue or tape! This is the second year we’ve made these and they are far and away the best stuffing we’ve ever had! We left out the bacon and it still had a ton of flavor. Sans onions, the stuffing would still be delicious. Thanks Deb! I use a small ice cram scoop to scoop the onions, works like a charm. It’s so good I always make the ill recipe then bake the stuffed onions surrounded by stuffing (it also helps hold together the occasional onion that breaks a little) I keep saying I’ll just make the stuffing without the opinions, but I just love the presentation so much! The roasted onion was a really fun idea, and using the melon baller did make this much easier than anticipated. The stuffing could use some tweaking though. 3 cups of onion was a ridiculous amount, especially given that the stuffing was cooked in onions. 2 cups on nuts was also really way too much (after looking at the amount, I used only about 3/4 cup and that was perfect. But would make this over again and again with better ingredient ratios. I made this last night and it was so yummy, as are all things smittenkitchen. The melon baller was genius. Didn’t have enough cashews so I used half cashews, half pecans. I reduced the ingredients proportionally, and STILL ended up with a casserole dish of extra stuffing, which we just scooped from to add to our plates. Definitely a bookmarked keeper of a recipe. Thank you!